The writing journey is all about discovering what works best of for each of us as individual, and very unique, writers. Learning from others is valuable in helping us glean tips and fit together the puzzle pieces that will form our own writing processes. Today, I’d like to share with you ten of the sites that inspire, educate, and help me refine my process—plus, they’re run by a bunch of super awesome folks! 1. Jody Hedlund: Her spot-on insights into the publishing and marketing processes never fail to offer me something to chew on. Plus, she has the best post titles in the business! 2. Nail YourNovel: Book doctor Roz Morris, author of the wonderful Nail Your Novel, offers an always refreshing take on the nitty-grits of storytelling. 3. The Bookshelf Muse: Run by Angela Ackerman and Becca Puglisi, authors of The Emotion Thesaurus, this site is best known for its insanely handy lists of synonyms for everything from facial features to colors to (you guessed it!) emotions. 4. Porter Anderson: His “Writing on the Ether” series is a fun, quirky, and always insightful look into the goings-on of the book world. 5. The Creative Penn: Joanna Penn’s site is fast becoming the go-to stop for independent authors who are trying to understand all the ins and outs of the system. She offers great advice on publishing and marketing and a super-helpful transparency about her own journey as an indie. 6. Mystery Writing Is Murder: Elizabeth Spann Craig dishes out both genre-specific and general advice, along with a great round-up of writing-related Twitter posts. 7. The WritePractice: This lovely site, founded by the always gracious Joe Bunting, offers sound advice and the forum-like opportunity to put writing lessons into practice. 8. Writer Unboxed: With dozens of highly qualified contributors (including agents, editors, and authors), this site tops blog awards lists every year. Always on point and always helpful. 9. L.B. Gale: As a fantasy author, Gale dishes particularly pungent insights to the spec-fic crowd. Her take is always unique and fun. 10. MoodyWriting: Aside from a generally awesome Twitter handle (@mooderino), this savvy Brit serves up timely and thought-provoking posts on writing and promoting. 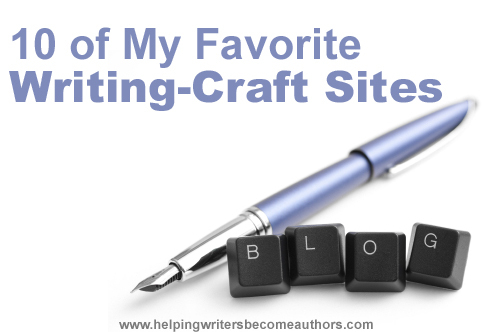 Plug these sites into your blog reader of choice and keep on learning! Tell me your opinion: What are some of your favorite writing-related sites? Aw, you’re very kind! Makes my day to hear the blog has been helpful.